Greetings loyal blog readers! I'm Natalie, a new contributor to 11 Spring Street, and am thrilled to share my craft/cooking/DIY successes (and many failures!) with all of you! 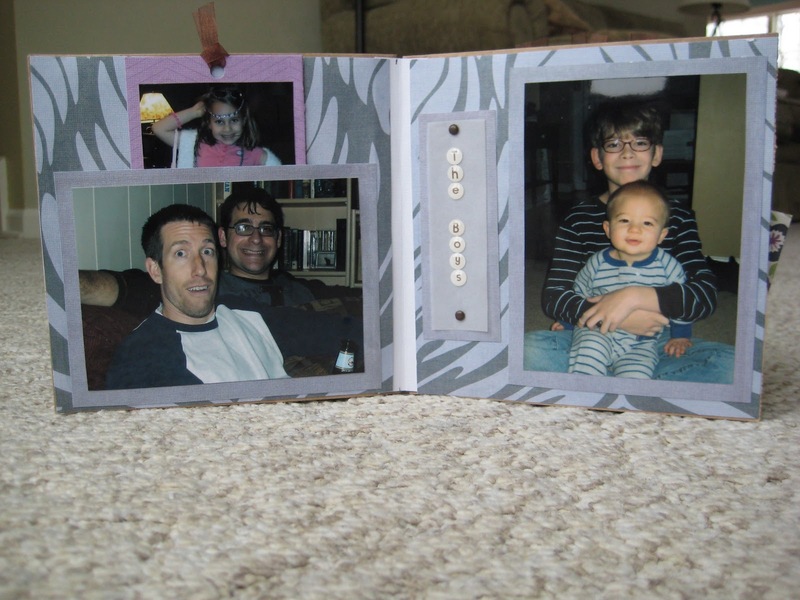 I do not consider myself a scrapbooker. The process of sorting, printing and arranging photos seems daunting to me, and with a 5 and 2 year old, I just don't feel like I can put that kind of time into one project at this point in my life. 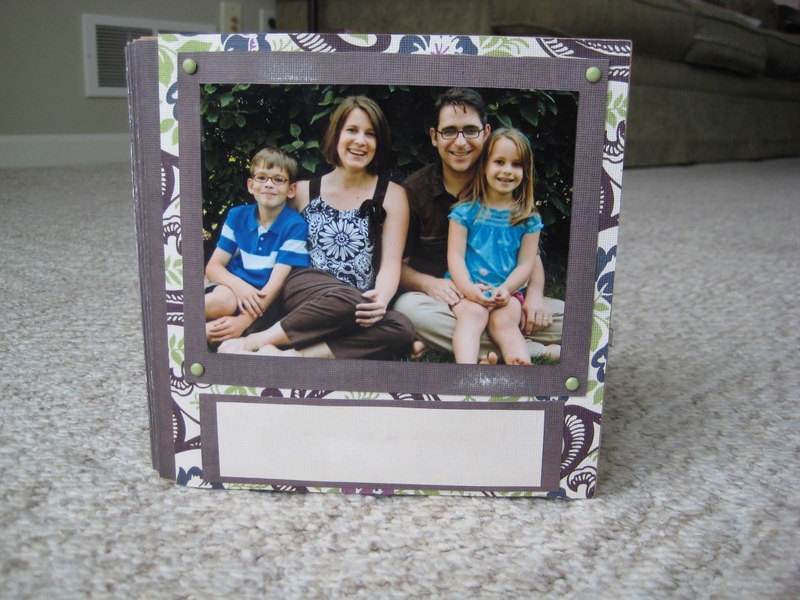 I'm more of an "insert-photos-into-prearranged-layouts-and-purchase-a-book-through-Shutterfly" kind of gal. The expense of all of the decorative do-dads, cutting/punching tools and paper has also been a deterrent for me to embrace this hobby. 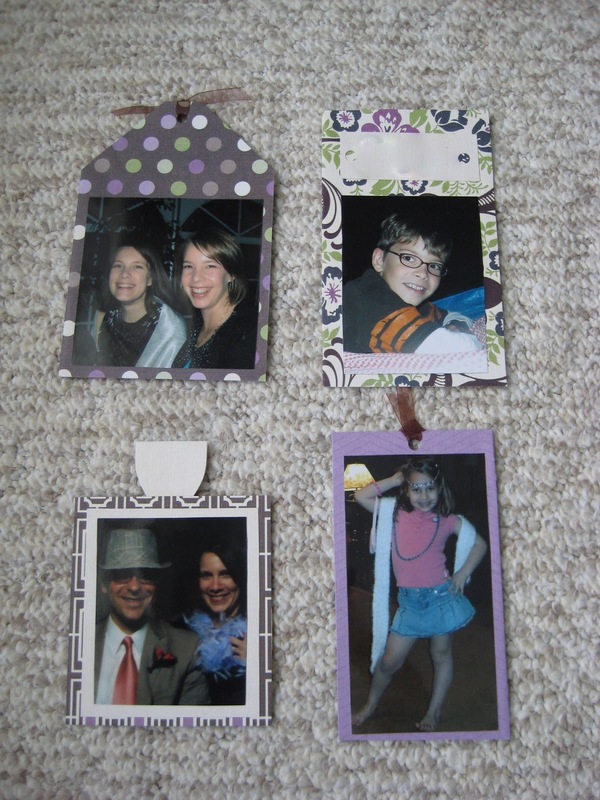 However, for Christmas 2009, my Mom, Sister and I decided to do a handmade gift exchange. I was racking my brain for an idea when I remembered some cute scrapbooks I had seen at a friends' house. This friend, (let's call her Amy since that's her real name), told me that the book was constructed out of brown paper bags! Yeah, that's right - the kind you can buy 100 of at Walmart for about $2. I could hardly believe it and immediately knew this would be my gift idea for my Sister's Christmas present. 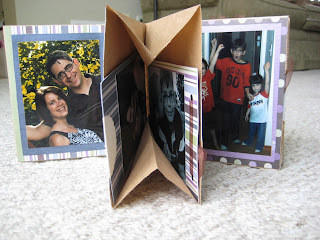 I went home and Googled the term "paper bag scrapbook" and lots of links came up. I've included a link to one tutorial that shows how to assemble the book, and one way of binding the edge. 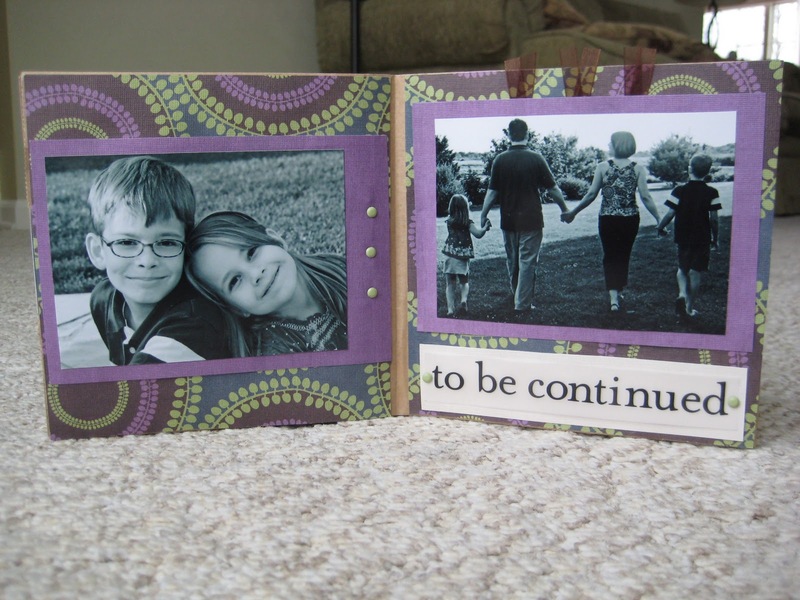 To keep it simple, I decided to limit the photos for the book I made to those from the most recent calendar year. Lucky for me, my sister had recently had some very nice family photos taken, and I had enough of my own photos of their family from the past year to supplement. Basically, you cover the paperbag pages with scrapbook paper (card stock weight works best), design your layout, add photos & embellishments and voila! I was super happy with the result, and although it did take me about 6-8 hours worth of work to finish up this bad boy, I have to think that it was a lot less time than a traditional "from scratch" 12x12 (or whatever the traditional size is) scrapbook. All in all, I spent about $40 on materials. That included a large pack of fancy scrapbook paper, Mod Podge adhesive (more on this later....), embellishments, paper bags and photo printing. Use those 40% of JoAnn Fabric coupons, of course! Now, $40 might seem like a lot, but I have enough of the materials left over to probably make 2 additional books of the same size. So, let's say the cost was closer to $15 for the one book. 1) The novelty of it being made out of paper bags! Here's a tip that I will share with you if you decide to make one of these books. Use double sided tape to stick down things that need sticking. 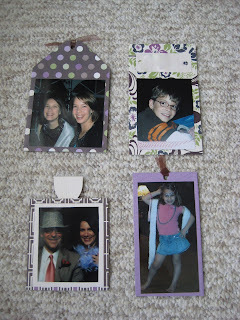 I used an adhesive called Mod Podge to glue everything down that needed gluing. Only later did someone suggest to me that you can also use double sided tape - DUH, why didn't I think of that?? I would definitely try that next time, as once in awhile the Mod Podge would seep out from under the edge of the item being glued and get on my fingers or worse, one of the photos, and kind of smear up the finish a little. Additionally, and perhaps more importantly, using tape would eliminate all of the drying time required in between pages. Here are some photos of the finished album I made. Names have been removed to protect the innocent! 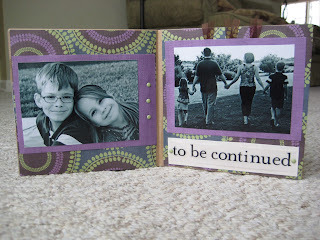 Here's an example of the pockets created by some of the pages and how you can tuck additional photos or momentos inside. Other hiding spots for additional photos can be created when you only glue/tape down three sides of the main photo on the page, as in the page on the left. The photo behind it is on its own individal card that can be pulled out. Vellum and transfer letters came in super handy to create the look I wanted. 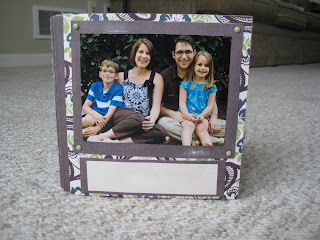 Some of the additional photo cards I made for inserting into pockets within the book. I love the idea of making one of these for a kiddo for their birthday, or for a spouse to have on their desk at work. I'm greatly looking forward to seeing the projects of other contributors and hearing what our readers have to say! "...let's call her Amy since that's her real name." Classic. Welcome to the blog, Nat!! I really like the accordian fold binding method. Cool book!